MRCBFVs MMRCA 2.0: Is India Becoming The Next Battleground Between USA & France. There is no doubt that Indian military has been a victim of stiffy bureaucracy & deceptive political propaganda which compromised our military preparedness to some extent. Starting from BOFORS scam to a Fake political Conspiracy on $7.8 Billion Rafale Deal, we have seen the dark side of these activities. However, the lengthy weapon acquisition process is responsible for delays in inducting sophisticated weapons in our military arsenal. Meanwhile, The revised DPP is unable to bring transparency in fast-tracking the signing of major defense deals. We recognize IAF ‘s RFI of inducting 110 MMRCA to make up with it’s depleting & aging fleet on one hand while Indian Navy’s struggle for spares of Mig-29k erupted the RFI for 57 MRCBF to equip INS VIKRANT on the other hand. With an estimate of $30 Billion & demand of 167 fighters in one of the world’s largest lucrative defense market, it has attracted major Aerospace hubs to grab the deal at any cost. Definitely, every competitor won’t let it lose. The major competitors among which American F-16 Block-70 & F-18, Russian SU-35 & MIG-29k, French Rafale, Eurofighter Typhoon & Saab Gripen are competing for these deals. 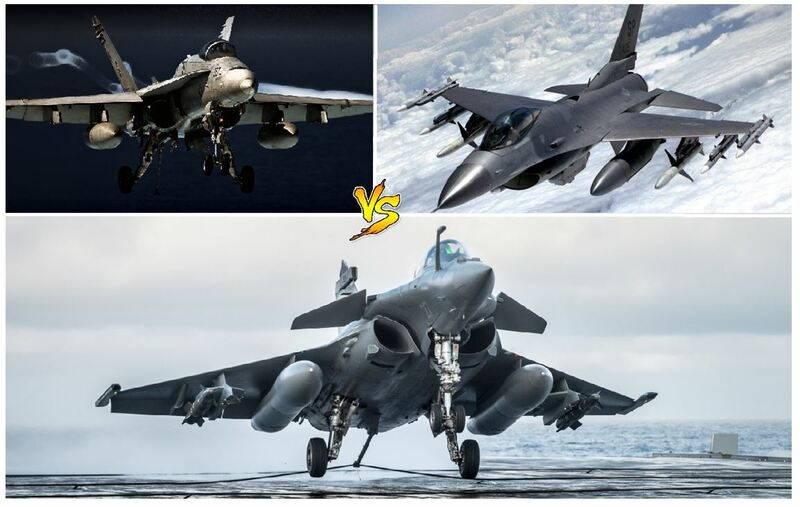 As it’s a multi-billion dollar tender & both military wings want twin-engine jets due to its advantage over single engine bird, the option of competition seems to be tough between two countries & they are USA & FRANCE. Let me give you details why rest of the fighters will get rejected at the first phase of testing Saab Gripen is a top-class fighter having great AESA &BVRAAM capability but a single-engine plane. So, India has more chances of not preferring Gripen for IAF & IN. Fielding Su-35 as a contender under IAF MMRCA tender is a surprising move by Russians. Both Indian & Russian are in negotiation for SUPER SUKHOI programme, buying a Heavy class fighter under Medium class provision won’t be a decent choice. Then the next option is EU Typhoon which IAF won’t prefer to choose due to spares issue. Typhoon is built by four European nations & the technologies that incorporated with this fighter separately belong to the respective nations. This would be a lengthy process which IAF would definitely eager to avoid. Another drawback of Typhoon is, it doesn’t have Nuclear Delivery Option. French Rafale is, however, a viable competitor for both MMRCA & MRCBF deal. Being a twin-engine fighter with a sophisticated AESA radar, powerful EW suite, as well as an awesome BVR capability including Nuclear Trigger option, both versions of Rafale, have a good chance of winning these tenders. Previously, India has bought 36 Birds. So, the necessity of acquiring spares won’t be a trouble anymore. If India merges these two tenders under one deal, then we would able to see around 140 fighters being made in India and It will save the time as well as the money. The final contender is ‘Juggernaut USA’ which fields both F-16 & F-18 for MMRCA while F-18E for MRCBF. F-16 has been upgraded with some 4.5th tech&After signing of COMCASA, it will give access to their advanced communication systems. But F-16 lacks twin-engine capability leaving only American F-18 to contests with Rafale.we need to remember that IAF doesn’t feel comfortable with USA’s end user agreement & F-18 was also failed in first two phases of testing under MMRCA 1.0 tender a decade ago. Looking at the upgrades, F-18 can sign positive for Naval MRCBF deal. Moreover, it will be a headache for India to operate Mig-29k & F-18E from one platform. This will cause tensions among the three nations over data sharing & espionage issues. The interoperability may not get achieved by acquiring F-18. The complexity over acquiring S-400 system & F-18 together may complicate US interest. The future acquisition of S-400 & S-500 Batteries will be a boiling point for Indo-USA relations which is likely to affect F-18 entry into Indian military arsenal. But Americans are factual about grabbing major defense deals at any cost. They could put more pressure on India to sign both these deals with their company. They either intend to play another tactic with a condition to buy the Electromagnetic Aircraft Launch System under F-18 sale to India. With such provision, it will be a tough situation for our military planners to choose the right partner. Therefore, many developments are going to happen. Americans have high stakes in India & they won’t take a deep breath until unless both the deals get signed with their companies. The two major American aviation giants, Boeing, and Lockheed Martin are set to have $94 and $ 45 billion assets compared to Dassault Aviation’s $5 billion. Their superiority in media & diplomacy management with US Congress & state department would definitely plan to sabotage Dassault efforts to win these tenders. If Americans lost out to $30 billion deal, then it could be a huge financial loss for them in the history of their military sale to the rest of the world. Once the tender of 167 fighters is gone to non-American hand could result shutting down of F-16 & F-18 production forever. That’s why it’s expected that India to witness Political and diplomatic BATTLE between USA & FRANCE in near future. if French wins the tender, then hope, Donald Trump won’t get freaked out like Former British Prime Minister David Cameron when Typhoon lost to Rafale in the finale of MMRCA 1.0 competition. Therefore, let’s hope for the best & the deal gets signed with the suitable bidder as soon as possible with zero percentage of Delay & bureaucratic hurdles.